In post-apartheid South Africa, a pair of homicide cops, partners and friends, struggle with what divides them. Detective Inspectors Harry Mason and Jacob Tshabalala, both decent men, share a view of law enforcement that makes the job something like a calling. Both, however, are products of their cultures, and in a sense trapped by them. In “the New South Africa,” seven years after the ascent of Nelson Mandela, their differences have become manageable. And then the horribly mutilated body of a ten-year-old child is found, a ritual murder to which black and white cops react in sharply different ways. Harry, himself a father, can focus only on the brutality of the crime. Appalled by it, he desperately wants the killer caught and punished. Every Zulu on the force, including Jacob, feels the same, but they see another dimension to the brutality, one that unnerves them: “bad muti” (magic), the work of a powerful and dangerous sangoma (witch doctor). Urbanized and westernized though they are, the grip of the old ways is tenacious. Suddenly, Harry and Jacob find their value systems at war, their friendship at risk and a remorseless killer reaping the benefits of their conflict. Lots of characters to like, lots of vivid evocations of an interesting time and place, lots of pages to turn, lots of time to mark. 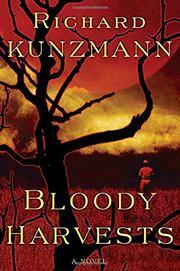 Still, Kunzmann’s debut is an impressive successor to James McClure’s apartheid procedurals.